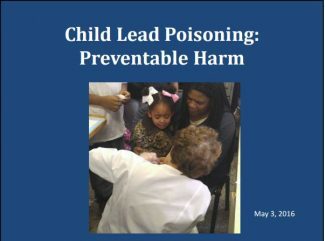 On Tuesday, May 3, 2016, the Coalition on Human Needs, First Focus, Children’s Leadership Council, Partnership for America’s Children, MomsRising, and the National Head Start Association hosted a national webinar open to the public on child lead poisoning. The lead poisoning of children (and adults) in Flint, Michigan, has focused the nation’s attention on the terrible human cost of allowing contamination of our water supply. We have since learned that lead in water affects many communities nationwide, and that lead from paint in older buildings is an even more prevalent source of child poisoning. We have known about this for a long time, and steps to reduce the lead around us in previous decades have dramatically reduced the number of children suffering from lead poisoning. But reduced investments by local, state, and federal governments have slowed our progress and brought preventable harm to more than half a million U.S. children. Dr. Jennifer A. Lowry, MD, a pediatrician and national expert on medical toxicology, including lead poisoning, practicing at Children’s Mercy Hospital in Kansas City, MO. She directs the Mid-America Pediatric Environmental Health Specialty Unit (PESHU) for the Environmental Protection Agency (EPA) Region 7 and serves as chair of the American Academy of Pediatrics’ Council on Environmental Health. Colleen McCauley, Health Policy Director at Public Citizens for Children and Youth in Pennsylvania. She works on child health policies, with special emphasis on low-income and undocumented children in the metro Philadelphia area. Prior to joining PCCY in 2001, Colleen was a nurse and former Assistant Director of the Abbottsford Community Health Center in Philadelphia. Click here to replay an archived recording of the Webinar, provided by the Coalition on Human Needs.